Change is hard. Whether you’re trying to kick a bad habit or improve an attitude, making the transition is never easy. Think about some of the changes you’ve attempted to make. Maybe it’s having one cup of coffee a day instead of two, or eating a salad for lunch rather than a burger. Perhaps you’ve vowed to focus on the positives of life instead of the negatives that cause stress. In theory, these changes are simple. But no matter what you’re trying to transform, change is often much easier said than done. For organizations, the path to change can seem long and arduous. How do you convince different groups of people with varying positions and motivations to commit to a singular goal? And what do you do when that goal is as important as the delivery of your customer experience? Luckily, at Fifth P, we’re experts at working with organizations to engage their people to deliver the desired customer experience. We’ve helped many organizations convince employees of the need for an improved customer experience. And then we guided them through how to design that experience and taught their people how to deliver it. We believe that an organization’s customer experience can always be better. Most senior leaders understand the concept of testing and improving their organization’s customer experience. As technology advances and products change, so too do markets, businesses and customers. An organization’s ability to adapt to an evolving business environment is vital to its success. But sometimes, the need for constant improvement gets lost on on employees. Without identifying the need for improvement, there will be no sense of urgency among employees. They won’t understand why changing their thoughts and actions is important to the organization’s success. Senior leaders must convey their sense of urgency for improving the customer experience to employees. Part of this step is sharing the benefits of a customer experience improvement with employees, both for the organization and as individuals. When organizations create a sense of urgency, employees develop an understanding of what’s in it for them and thus the compelling reason to commit to customer experience improvements. Too often, organizations default to telling employees how to deliver a great customer experience. To deliver a brand promise, employees need to first understand the experience the organization wants to create. We like to refer to this as developing the right mindset within an organization. The first step to developing the right mindset among employees is creating an experience purpose for them. An experience purpose is an expression of a brand that articulates to every employee the role they play in delivering the brand promise. It’s only when employees have a true understanding of the experience purpose that they will realize how small changes in their thoughts and actions can have a significant impact on the customer experience they deliver. This is an important component of developing the right mindset within an organization because even the smallest actions and benign thoughts can have a significant impact on the customer experience. Every leader, employee and stakeholder affects the customer experience. An organization must connect the experience purpose to every person’s role in a defined way. Once the right mindset is adopted organization-wide, delivering great customer experiences will become second nature. Everybody knows The Golden Rule: treat others as you want to be treated. In business, the modified Golden Rule is treat employees the way you want employees to treat customers. 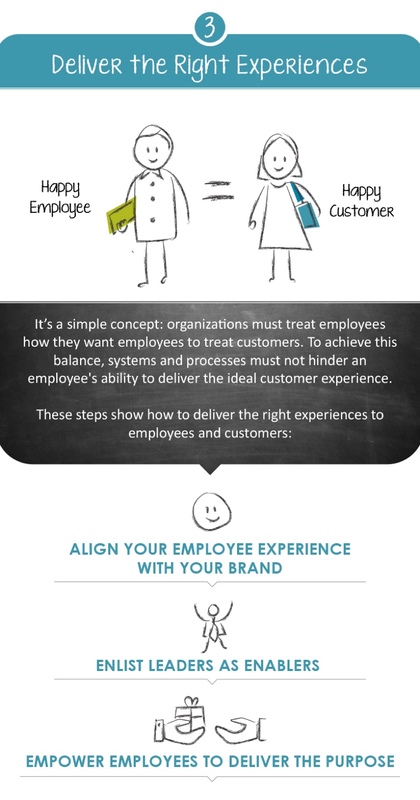 We call this aligning your employee experience with your brand. Organizations shouldn’t expect their employees to care about their customers if they don’t care about their employees. Following The Golden Rule is the first step to delivering the right experiences. The next step in the process is enlisting leaders as enablers. Employees need to see their leaders embrace and commit to living the brand’s purpose before they are willing to dive in and live it too. Finally, organizations must empower employees to deliver the experience purpose we discussed in the above section. And when employees do deliver the ideal customer experience, the organization must recognize them for a job well done. Once all of these things happen, an organization will have succeeded in delivering the right experiences to both employees and customers. 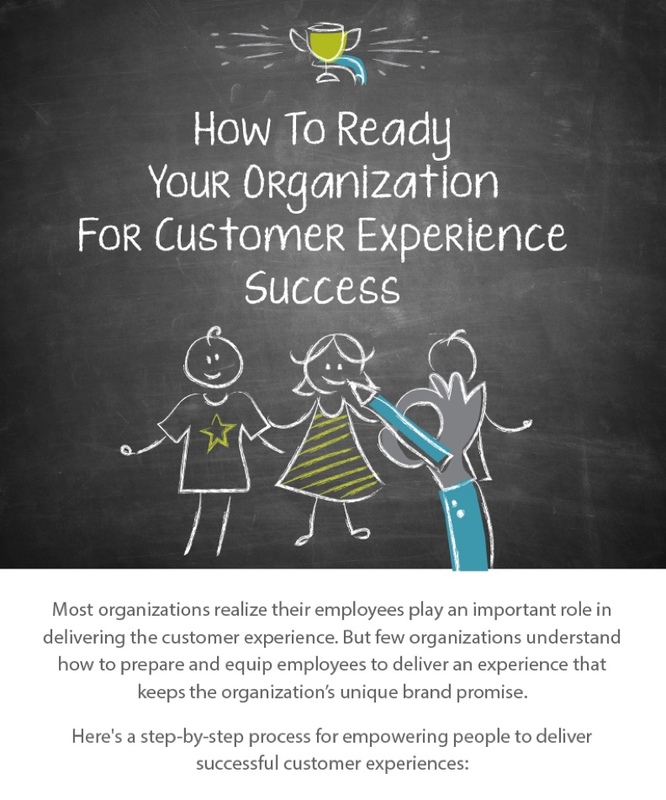 More than half the battle of delivering great customer experiences is getting employees on board and readying the entire organization for success. If you want to talk to us about how you can ready your organization for customer experience success, we’d love to connect. In the meantime, here’s the full infographic in case you want to share or blog about it! Share This Image On Your Site – Please include attribution to fifthp.com with this graphic.